P2 or P4 USB MicroAB connectors: The board is supplied automatically with 5 V when connected to a PC through a USB A to Micro B cable. The LPC microcontroller can use the USB interface as a USB device. PWR: Power may also be supplied by an 8-12 VDC external power supply which is capable of providing up to 500mA of current. The PWR connection at P1 uses a standard 5.5mm barrel plug with a 2.1mm inner diameter. The center conductor provides positive voltage. IC1 reduces and regulates this to 5.0VDC. Please note that the debug interfaces (JTAG / Cortex-Debug and Cortex-Debug+ETM) are extremely sensitive to electrostatic discharge (ESD). Connect the debug interface (e.g. 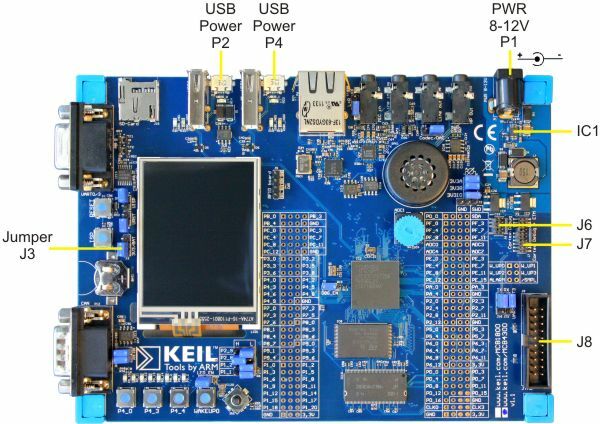 ULINK2/ULINKpro) to the board via JTAG or Cortex-Debug connector (J6/J7/J8). Then connect the external power supply to connector P1 or to one of the microUSB connectors P2 or P4. Disconnect the board in reverse order. The voltage regulators IC3 and IC4 generate 3.3 Volts DC to supply all components on the board. When jumper J3 is in the BAT position, the CR1220 lithium battery supplies power to the VBAT pin of the CPU to maintain the real-time clock.